Three unidentified police officers in Rosales, Pangasinan have been criticized by netizens for not arresting a gunman before a shooting incident. 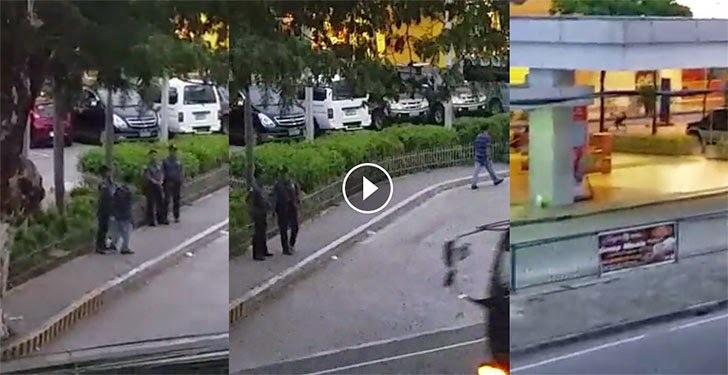 Genaro Mariñas, who uploaded the video on Facebook on Sunday, December 21, can be heard shouting at the policemen asking why they did not arrest the armed man or even take his gun. In the video, the suspect can be seen talking to the police officers for a brief moment before walking away towards a mall parking lot. After a few minutes, the sound of several gunshots reverberated through the air. Another person can be heard in the video saying someone was hit while the police officers were shouting "dapa!" Then a man in civilian clothing is seen kicking the gunman. The viral video has garnered over 3,600 shares and 59,000 views as of this posting.